Sometimes, all you need is a few less main characters, and a whole lotta blood (more than the normal amounts) in order to spruce up the sub-genre of zombie horror as we all know it – to hell with survivors in a mall, or a contingent that’s dashing wildly to the CDC in hope of a cure. Just stick a couple of remorseful souls out in the woods and let the plasma fly! 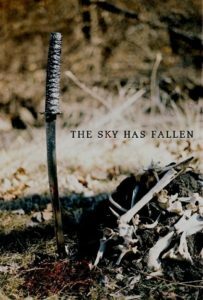 Director Doug Roos simplifies the scenarios, and ramps up the violence in The Sky Has Fallen – a zombie film that has plenty of drama contained within among all the slicing and dicing. Sure, we’ve got the atypical apocalypse at hand, and those who haven’t been victimized have simply hoofed it out of the most dangerous locations, and for good reason: these aren’t your ordinary, run of the mill eat your flesh undead – these stalking, statuesque murderers are controlled by a small clan of black-hooded figures, and when the command is given, these decomposing lunatics begin to render flesh like no one’s business – it’s violent and it’s beautiful. The two survival-leads are Lance (McLaren) and Rachel (Kemper), and they are as effective at dispatching the grisly dead as they are hanging onto the memories of their former lives and families – a nice touch to inject some tear-jerking moments. Elements of samurai-films are ever-present with Lance’s katana work, and does he know how to operate that blade! The twosome hack and slash their way across a vast patch of wilderness in hopes of locating the hooded figures’ lead man, and along the way the audience learns some interesting factoids about the duo, and it assists with the formation of each character in such a way that makes them deeper than the usual zombie-movie harder-than-nails survivors. Both McLaren and Kemper work off of each other extremely well, and instances of a budding love-story begin to bloom amidst the chaos of the outbreak. Gore is at the forefront of a micro-budgeted presentation, and the only drawback from a pint-sized allocation would be the camera shots themselves, with far too many close-ups and not enough of a look at what might have been a scenic landscape for the surroundings. All in all, Roos gives zombie-fanatics a nice new piece of celluloid to feast on, and this could be looked at as the most “un-zombie” movie to be presented as such – this is a very large win for independent cinema in my opinion and isn’t a film that should be passed by.